Attached is a picture of our puppy Prem Ali. Prem is just 5 mths old and a wonderful dog. He LOVES his frisbee. As soon as you say the word frisbee, he gets an excited look in his eye and his tail immediately starts wagging. This picture was taken when I told Prem it was time to go. He decided that he and his frisbee would hide in the bushes so that he wouldn't have to stop playing. 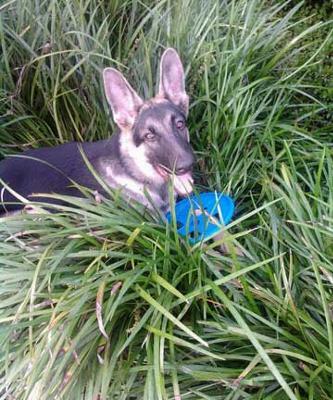 Comments for Our German Shepherd Puppy LOVES his frisbee!